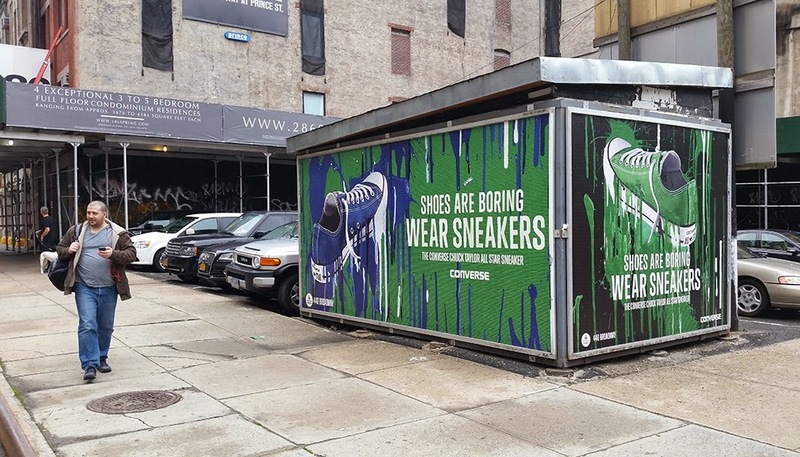 NPA outdoor, now Contest Promotions, once operated hundreds of street level billboards like this all over NYC. It turned out the advertising was illegal and public pressure, in addition to the valiant efforts of a dedicated Sign Enforcement unit in NY, brought down a lions share of the illegal signage. The company did not go without a fight and imposed a ludicrous business model to side step long standing NYC signage laws. More info on this can be found buried in this site, searchable using the post labels, but suffice to say NYC wasn't having it. Large penalties were imposed and eventually the company withdrew from NY almost entirely. And yet a few remaining signs still exist. Why? Outdoor advertising in NY, or 3rd party signage, must obtain the proper permit in order to be legally placed in public space. We do this to mitigate what would surely be an overwhelming glut of signage, turning our streets into a carnival of commercial messages. In many ways, these laws are a compromise between the public and commercial interests. Commerce demands access to our city streets in order to pedal its wares, and has the dollars on hand to be very persuasive. The public, understanding the detrimental effects of commercial messaging on our collective psyche, attempts to resist the pull of money by enacting laws which prohibit the placement and amount of signage that can exist. It is a delicate balance that is constantly being negotiated by both parties. This negotiation happens for one reason and one reason only and that is that the public has usurped private property owners right to do whatever they want with thier property, an entirely un-capitalist way to operate given how much we revere private property and its relationship to democracy. We have done this by collectively agreeing that the outer walls of a building, despite being owned by an individual, are not entirely private. These walls, facing into the public, have an effect on all of us and are therefore thier use can be controlled with the public's interest in mind. This is a lot like how our environmental protections prevent you from using your private property to dispose of toxic waste, knowing that this type of private property usage has a negative effect on us all. So why is this sign still up despite all the other illegal Contest Promotions signs being taken down? Outdoor advertising and the laws which we have enacted to police its presence, only apply to signage which is on the outside of a buildings property line. Technically this makes sense, prohibiting the public and Sign Enforcement Units in NY from interfering with a landlords right to do what he wants with the inside of his building or other things which have no effect on the public citizen as a whole. This sign, technically falls within the buildings property line and is therefore un policeable despite functioning like any other sign affixed outside of the buildings property line. The result is a tiny loophole which allows unscrupulous outdoor advertising companies and landlords to shirk the law and continue to operate illegal signage in our city. What a sham.